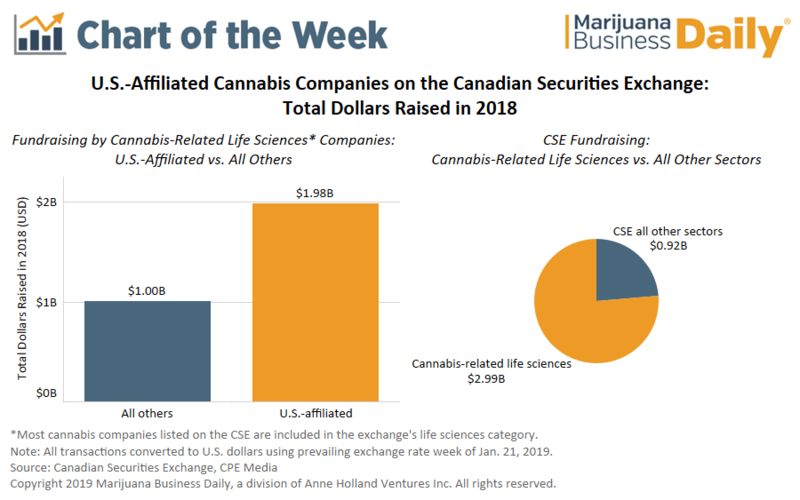 U.S.-affiliated medical cannabis companies dominated Canadian Securities Exchange (CSE) fundraising in 2018, raising nearly $2 billion through 50 equity-related deals. As of December 2018, 47% of the 124 cannabis-related companies trading on the CSE were based in the United States or had U.S. assets or interests. Cannabis-related companies in the life sciences sector – which includes most of the marijuana-related companies listed on the stock exchange – accounted for 76% of all raises by CSE issuers for the year, totaling just under $3 billion through 270 deals. Cannabis life sciences companies not based or operating in the U.S., including those operating in Canada and Israel, raised $1 billion through 220 deals. The top eight financing deals – accounting for 35% of 2018 CSE raises – were by U.S.-affiliated cannabis companies. They include Massachusetts-based Curaleaf Holdings (CSE: CURA) and New York-based Acreage Holdings (CSE: ACRG.U), which led the pack with individual deals valued at more than $300 million each. The CSE noted that financing through reverse takeovers (RTO) represented 51% of all financing in 2018 – up from 7% in 2017. Curaleaf, Acreage and other top performers – including Harvest Health & Recreation of Arizona (CSE: HARV) and MedMen Enterprises of California (CSE: MMEN) – are U.S.-based entities that listed on the CSE through RTOs. Of the 123 new CSE listings in 2018, 55 (45%) were cannabis-related companies. The diversified industries fundraising sector – which includes some investment companies that operate in the cannabis space – accounted for 13% of all CSE fundraising, displacing mining to become the second-most-active sector. Financing deals among U.S.-affiliated cannabis companies in the life sciences sector averaged $40 million each, while the average deal size for all other cannabis-related companies in the sector was $4.5 million. Money raised within the US does not mean production of Kilograms will be produced in the US. So before you invest it would be wise to know where a company is growing and producing its cannabis and at what price per ounces as compared to a competitor in foreign lands. From what I now understand it is the land size and production that will determine profitability. Especially when a company is sold or it mergers with another. Case in point, Pharma Cielo! Zimbabwe is about to issue 5 licences for CBD . Is it possible to contract Ebola or other diseases thru methods of consumption of tainted products?